When the British film Withnail and I was released in 1987, it wasn’t a huge hit. It took a VHS release for people to develop a taste for the movie, which follows two “resting” thespians, the dipsomaniac Withnail (Richard E. Grant) and I (Paul McGann), in 1969. Withnail and I visit Uncle Monty (Harry Potter’s Richard Griffiths) in the countryside for a “holiday by mistake,” one in which everything goes wrong. First-time director Bruce Robinson—who was nominated for an Oscar two years earlier for his script for The Killing Fields—based the screenplay on his own life as a broke actor in drama school living in Camden Town, England. Beatle George Harrison produced the film through his HandMade Films, which is why Robinson was able to use The Beatles’ song “While My Guitar Gently Weeps” on the soundtrack. The film launched the careers of everyone involved, including McGann (Doctor Who) and Grant. Here are 13 boozy facts about the cult classic. 1. WITHNAIL WAS BASED ON BRUCE ROBINSON’S FRIEND, ACTOR VIVIAN MACKERRELL. Robinson and MacKerrell were flatmates in the 1960s, and he based Withnail on his friend. “Withnail is basically me and Viv, but I didn’t sit there with a tape recorder and notepad writing down what Viv said,” Robinson told Daily Record. “I just took his acidity, his pompous cowardice, and his very pungent sense of humor and wrote that character.” MacKerrell’s friend, Colin Bacon, wrote a book about MacKerrell, who died of throat cancer in 1995 (Robinson believes that drinking lighter fluid in real life possibly led to the disease). 2. ROBINSON WROTE THE STORY DURING A DIFFICULT WINTER. At first the story was written as a novel, not a screenplay. A friend gave the novel to a guy who wanted Robinson to adapt it into a comedy TV series. Another guy came along and told Robinson, “this is going to make a great movie.” In 1980 that guy gave Robinson money to adapt it into a script, but the project went into limbo for six years. Eventually, George Harrison got a hold of the script and thought it was funny, and Robinson was in business. 3. SOME PEOPLE THINK THE MOVIE WAS FILMED IN THE 1960S. 4. THE NAME “WITHNAIL” COMES FROM ROBINSON’S CHILDHOOD. 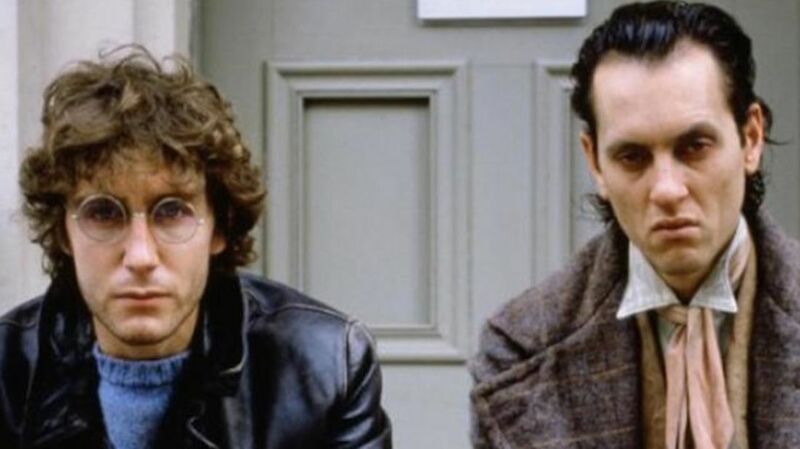 In 2013, Richard E. Grant revealed on Twitter that Withnail’s first name was “Vyvian,” but according to Robinson, in real life the guy’s name was Jonathan. “The reason he’s called Withnail is because when I was a little boy I knew this bloke called Jonathan Withnall—Nall. Because I can’t spell, I called him ‘Nail.’ And he backed his Aston Martin into a police car, and he was like the coolest guy I’d ever met in my life, so consequently that name stayed in my head." 5. RALPH BROWN AUDITIONED IN CHARACTER. In 1993’s Wayne’s World 2, Brown reprises Danny, this time as roadie Del Preston. 6. KENNETH BRANAGH WAS OFFERED THE PART OF I.
Robinson cast McGann as I, but Robinson didn’t like his Liverpool accent, so he fired him. During that time, Robinson considered Kenneth Branagh for the part. “I offered Paul’s part to Ken Branagh and he turned me down,” Robinson said. “He wanted to play Withnail, and I didn’t want him to do that. I didn’t think he had enough nobility. Marvelous actor that he is, there’s something about Ken that is the antithesis of Byronesque; he looks like a partially cooked doughnut. Richard looks like a f*cking Byron, you know.” Realizing McGann was the best choice, Robinson hired him back. 7. UNCLE MONTY’S HOUSE SOLD IN 2009, BUT YOU CAN STILL VISIT IT. The rural, 18th-century farmhouse where Uncle Monty lives is known as “Crow Crag” in the movie, but the actual place is called Sleddale Hall, and is located in Cumbria, England. In 2009, the dilapidated house sold for £265,000, but the new owner wasn’t able to pay for it so it went back on the market, and a man named Tim Ellis purchased it later in the year. After the sale, Ellis said he planned on keeping the Withnail presence in redecorating it. “I first saw the film about seven years ago and have been a fan ever since,” he told The Guardian. “I would like to restore the building in a way that other fans of the film could approve of.” In 2013, an outdoor screening of the movie was held at the cottage, where fans camped out and reveled in the surreal moment. 8. THE ORIGINAL ENDING WAS MUCH DARKER. 9. ROBINSON THINKS WITHNAIL AND I'S FINANCES MAKE THEM RELATABLE. 10. THE FILM WAS ALMOST SHUT DOWN BECAUSE THE PRODUCER DIDN'T THINK IT WAS FUNNY. “We thought we were being hysterical,” McGann said. “When we rehearsed it, it was going great and then suddenly somebody tells you’re about as funny as an orphanage on fire.” In the interim, Grant freaked out. “I had a quiet nervous breakdown over lunch, thinking, ‘Oh I’ve told everybody I’ve finally made a movie and now the thing’s closing down,’” he told Premiere. “And David Wimbury, the [co-producer], said, ‘Oh no, it’s just a ploy. The American [O’Brien] is trying to frighten Robinson, and Robinson is calling his bluff.’” By four o'clock that afternoon the producers caved and production continued. 11. NATURALLY, THERE’S A DRINKING GAME ASSOCIATED WITH THE MOVIE. “The rules for the Withnail and I drinking game are very simple … just match Withnail drink-for-drink,” reads the rules. A caveat: Keep in mind the events of the movie take place over a couple of weeks, so if you do match them, and especially if you drink lighter fluid, you will probably die. The game says you need gin, cider, ale, sherry, whisky, red wine, and either lighter fluid or vinegar (that’s what was used in the movie) to drink along. The movie begins and ends with imbibing red wine, and in between there’s a combination of everything else. We would say “don’t try this at home,” but that’s the point. 12. IN REAL LIFE, GRANT’S ALLERGIC TO ALCOHOL. In an ironic twist, Grant doesn’t smoke or drink, mainly because his body cannot process alcohol. In order to immerse Grant into the role of boozer Withnail, Robinson forced Grant to get drunk one night so he could have a “chemical memory” for his acting. 13. FANS WON’T STOP QUOTING THE MOVIE TO GRANT AND ROBINSON.